1" thick polyurethane layer offers dramatically increased flexibility. The ideal backing plate when thinner buffing pads are being used. 3" Diameter works perfectly with Buff and Shine's 3.5" pads. 5/8" x 11 thread fits most rotary polishers. It's a new buffing world out there, even for the classic rotary polisher. Some detailers have transitioned to the use of thinner buffing pads, like Buff and Shine's Microfiber pads or Uro-Tec pads. Buff and Shine's Xtra Soft Backing Plates are an ideal match for these and other thin pads. 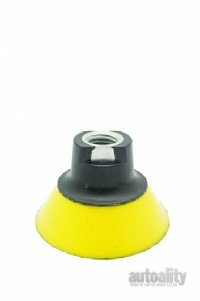 Constructed with a 1" thick polyurethane layer, Buff and Shine's Xtra Soft Backing Plates can offer dramatically increased flexibility that can make up for the loss of flexibility that is sometimes experienced with thin buffing pads. With these backing plates, the detailer who loves the performance of thin pads can also enjoy the capability of working contours in the vehicle surface that are otherwise more difficult to reach with traditional backing plates. You will find that the Xtra Soft Backing Plate allows superior control and distribution of pressure over body style lines. It provides virtually 100% surface contact across contours while reducing the potential for damage to protruding body style edges. As with all their backing plates, Buff and Shine takes as much pride in manufacturing great backing plates as they do manufacturing great pads. Their goal is to manufacture a backing plate that spins true...and they cannot overemphasize this point. If a backing plate wobbles at slow speeds, it becomes a major wobble at higher speeds. Fewer wobbles mean jobs get done quicker and better. With attention and dedication like this, you can see why Buff and Shine is different from other pad manufacturers.